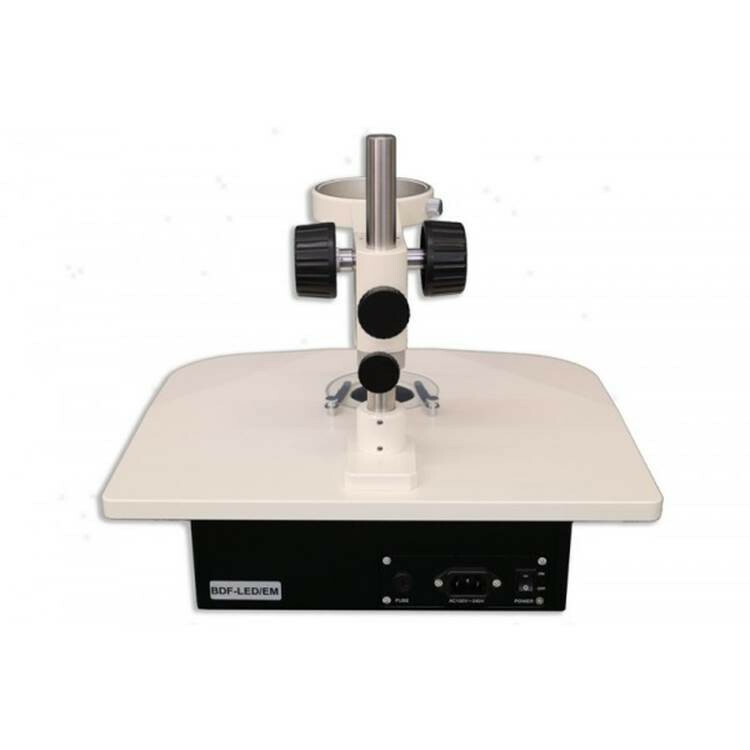 The Meiji BD-M-LED is a research grade Brightfield / Darkfield Pole type stand for the EM Series stereo microscopes. It has a large stable work surface and variable intensity LED illumination. 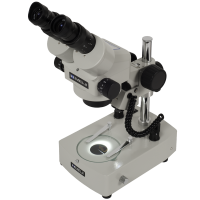 It makes for an effective tool to view living bacteria, cells or embryo transfer where darkfield or oblique transmitted illumination is critical to the experiment. Limited Lifetime Warranty. A rotatable lens/mirror system in the base provides transmitted LED variable-intensity illumination and a sliding mirror provides tilt, as well as front to back movement which allows the user to vary illumination from Brightfield LED to psuedo-Darkfield LED illumination at an appropriate angle. The stand has an integrated F series focusing holder with 55mm of travel protected by a slip clutch and tension adjustment. It features two stage clips, a 94.5 mm glass stage plate, and is equipped with an automatic voltage (100v to 240v) sensing power supply and a 20mm vertical post. Dimensions: 330mm (13") wide by 280mm (11") length by 85mm (3.37") high. Shipping details: 17 x 14 x 9 inches, 10 lbs. 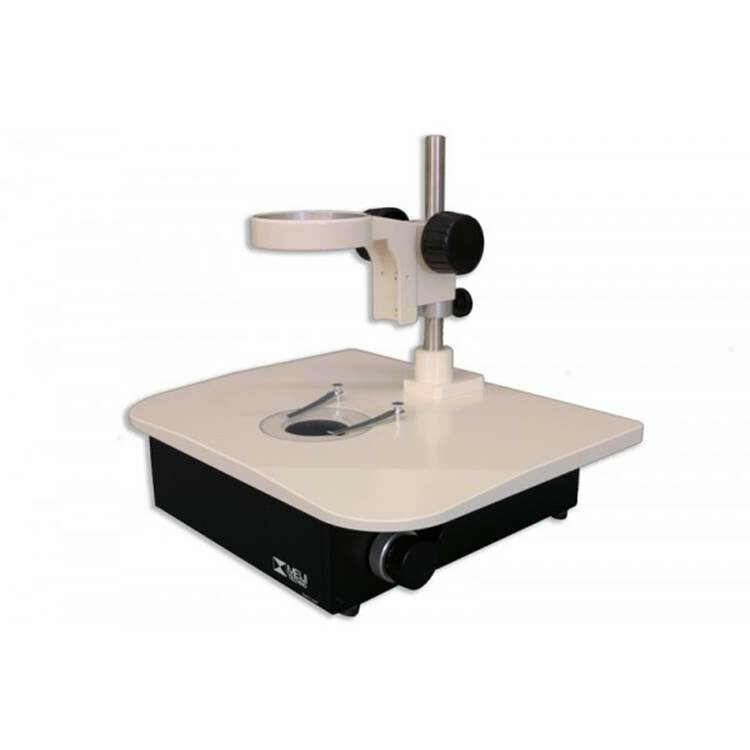 The Meiji BD-M-LED is a research grade Brightfield / Darkfield Pole type stand for the EM Series stereo microscopes. It has a large stable work surface and variable intensity LED illumination. It makes for an effective tool to view living bacteria, cells or embryo transfer where darkfield or oblique transmitted illumination is critical to the experiment. Limited Lifetime Warranty.IlluminationA rotatable lens/mirror system in the base provides transmitted LED variable-intensity illumination and a sliding mirror provides tilt, as well as front to back movement which allows the user to vary illumination from Brightfield LED to psuedo-Darkfield LED illumination at an appropriate angle.StandThe stand has an integrated F series focusing holder with 55mm of travel protected by a slip clutch and tension adjustment. 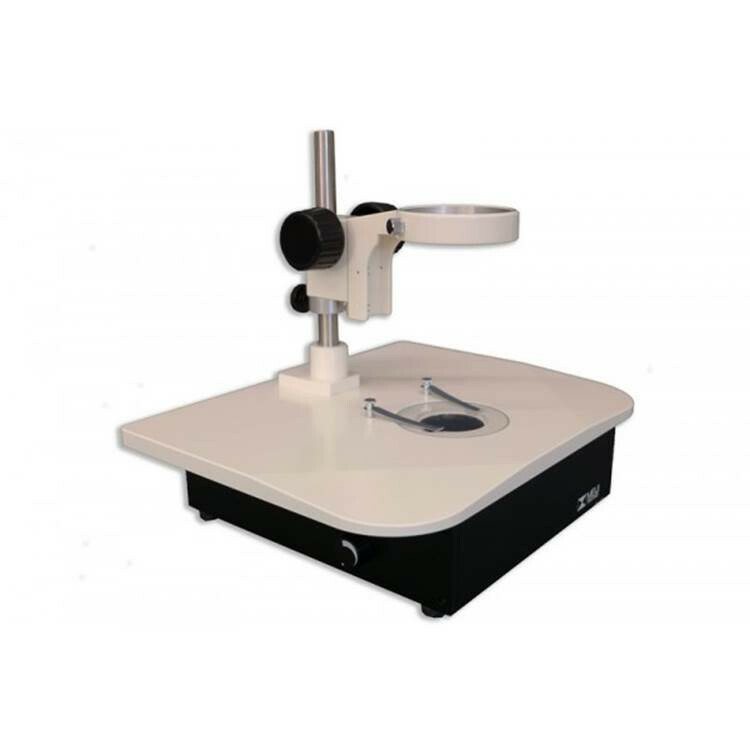 It features two stage clips, a 94.5 mm glass stage plate, and is equipped with an automatic voltage (100v to 240v) sensing power supply and a 20mm vertical post. Dimensions: 330mm (13") wide by 280mm (11") length by 85mm (3.37") high. details: 17 x 14 x 9 inches, 10 lbs.